Biting into cooked amaranth tastes and feels very much like tobiko, or flying fish roe, which I used to eat a lot of at sushi restaurants several years ago. Making your own faux-roe out of this tiny, super-soft and silky pseudograin requires only a few ingredients and a little bit of time and effort to achieve. 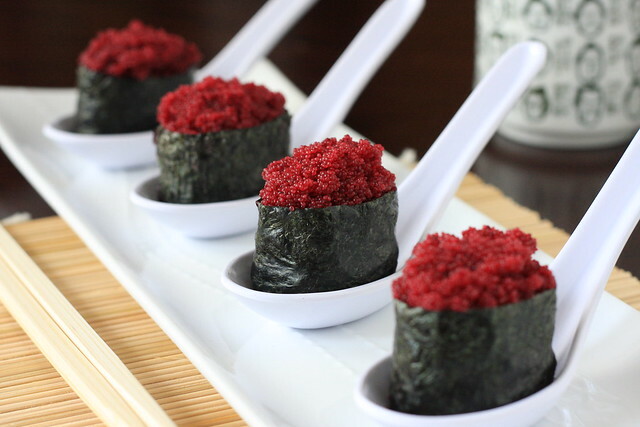 To develop its color, I boiled the amaranth in a super-concentrated beet base, and then soaked it further, which resulted in a perfect batch of deep crimson tobiko. 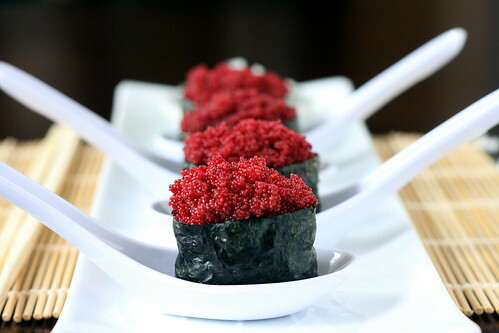 I then prepared the vegan tobiko in the way I used to enjoy it: gunkanmaki-style. This method requires no mat or rolling, and is very simple to assemble. The beets give the faux-roe a subtle sweetness which perfectly compliments the saltiness of soy sauce, the tartness of the vinegar in the rice and the briny, fishy taste of the roasted nori. Serve with a small bowl of pickled daikon on the side for a delicious, elegant, balanced and visually stunning sushi dish. If you are using prepared beet juice, skip to Step #2. If you are using fresh beets, place them with the water into a medium-sized saucepan. Bring to a boil, then reduce to medium and simmer for about 20 minutes, stirring occasionally. Mash the beets with a potato masher, then strain. Reserve the beet pieces for pickling or roasting later. Bring the beet juice to a boil in a medium-sized saucepan. Add in the amaranth and whisk well. Boil, uncovered for about 20 minutes, whisking occasionally to ensure it does not stick to the bottom of the pan. (The amaranth should be slightly al dente—do not overcook.) Then, place the cooked amaranth with any leftover liquid into the refrigerator to cool and soak. When you are ready to prepare the gunkanmaki, place the rice and water into a rice cooker. While it cooks and steams, combine the sugar, vinegar and salt in a separate glass bowl. Set aside. Cut the nori sheets into 1 to 1 1/2 inch ribbons. Set aside. Toss all of the pickled daikon ingredients together and place into the refrigerator to chill. Place a small strainer over a bowl. Take the faux-roe out of the refrigerator and spoon some of it into the strainer so it can drain slightly. When your rice is ready, place it into the glass bowl and stir well. To assemble the gunkanmaki, keep a small bowl of water nearby. Dip your fingers into the water before handling the rice. Shape the rice into small oval shapes, about the size of your thumb. Then wrap one of the nori strips around that, securing the end with a little bit of water to seal it. Spoon some of the slightly-drained faux-roe over the top. Serve with soy sauce and the pickled daikon. Wow–that's BRILLIANT! The kind of thing that makes a guy like me say, "Why didn't I think of that?" Thanks so much! That means a lot, especially coming from you … cheers! It looks really good… very colorful, i like it! So original and so COOL! I love the whole idea of this! This looks amazing! Vegan sushi rocks my socks. I have been addicted as of late. I think Sunday supper will be sushi – again! An inspired dish indeed. Hats off to your creativity! As a fellow vegan girl cooking for a Meat-and-Potatoes guy, I'm very much looking forward to experimenting with your recipes! I just subscribed to your feed. Looking forward to more of your creations.